Whats better than a hog roast, Apple Sauce And Crackling! Hog Roast Hire a perfect choice for any occasion. Nothing beats the great smell of a Hog Roast! With a spoonful of apple sauce, amazing crackling, served up with stuffing and a side salad, a Hog Roast is a fantastic, cost effective way to entertain and feed you, your family & friends and up to 100 more should you need to. Particularly popular at Weddings and Anniversary parties, we have also catered for Summer Fetes, fundraising events, sporting presentations, Festivals and Band nights. You name the occasion, the chances are a hog roast will hit the spot. We use free range, organic, locally sourced pigs and can cater for up to 120 at a time. So if you need to cater for the masses, a hog roast might be the a perfect solution. Or complete our booking request form. How long does a hog roast take to cook? The average time to cook a pig is 6 hours. It can vary from 3.5 hours to 8 hours depending on the size of the pig. For every 10 kilos of pig you need a clear hours cooking time. This can also vary slightly due to time of the year location etc. In the summer on a hot sunny day the cooking time can be reduced by a good hour as the sun beats down and helps to reduce heat loss from the machine. In the winter the cooking time can go up by a couple of hours as the pig could be colder due to the weather and the machine can loose a lot of heat through the outside temperature. Location can also play a part as a very windy location can increase the cooking time. How many people will a pig feed? An average size pig (50 kilos) will feed 100 people on to a real plate, 120 people onto a disposable plate accompanied by salads and potatoes etc or make 160 5inch rolls or 200 4inch rolls. Bigger or smaller pigs can be provided. We do a smaller machine which will cook up to a 35 kilo pig and is ideal for smaller parties of 10 – 50 people. Are there a minimum number of people you cater for? No there is no minimum number of people, however, there is a minimum price. This is dictated by the number of people, time of year, day of the week, menu choice and location. The best thing to do is to fill in the enquiry form with whatever information you have to get a guide on the price. Remember the more and better quality of the information the better and more accurate the quote. We have catered for various different sized events over the years, from small dinner parties with less than 20 guests to larger events catering for thousands. We have the facilities to cook several pigs to cater for as many people as necessary. We also have smaller machines to roast smaller pigs or lambs, turkey, chickens etc for special occasions with fewer numbers. Can we provide our own pig? Yes we can cook your meat for you or we can simply hire you a machine and let you do your own event. If this is done as part of a bigger event there is not a very big saving from a financial point of view as the only saving for us is the cost of the pig and there is often a lot more work involved for us collecting the pig and preparing it on site. The benefits are really that you know exactly what it is that you are eating and where it has come from. Can you just do the pig along side other food? Yes we can do as little or as much as you require. If you want to provide the other catering we can just cook the pig to compliment it. Or if you are using a venue which wants to provide all the other services we can just cook the pig whilst they do everything else. We are happy to do whatever your requirements are. You can even hire a machine with or without a pig and do all the catering yourselves. What if the weather is bad on the day of our event? We can do a hog roast either inside or outside. While having hog roasts outside may be perfect for an outdoor event or BBQ in the summer it’s not ideal for a Christmas party! Holding your hog roast indoors is just as easy for us to do and just as enjoyable for you and your guests. So if the weather does let you down on your special day we can always make arrangements to cook inside. As long as we have a large well ventilated space it is not a problem. Or we can cook the hog roast outside and then move it inside to serve. Another alternative would be to hire a marquee for your event. Some of my guests don’t eat pork. Is there an alternative? We do some great salads! What is the cost for a hog roast? Our prices are based upon a number of factors such as location, number of guests, date of the event, your choice of menu etc. As we can change and adapt our sample menus to suit your preferences this will also affect the price. Every customer and every event is very different so pricing is also individual. When making an enquiry with us we will take the basic details of your event and what you want then arrange your own personal quotations. Our prices are always reasonable and we have a menu to suit all budgets and all occasions. All of our menus include a Pop Up events chef and catering assistant to prepare, carve and serve.Whether you require serving staff or not are entirely your choice. Again every event is very different and we have catered for all different styles. We can provide an informal style buffet where guests help themselves or a more formal style of event where food would be served to the table by professional waiters/ waitresses. Some of our packages will include experienced waiting on staff and front of house person. What areas/ locations do you cover? We cover the South Hampshire but have been known to creep into Berkshire, Surrey and West Sussex, Call us regardless and will always try to help. Is cutlery and crockery included in the final quote? Yes. Your quotation is fully inclusive of all cutlery that you will need. For some packages this will simply be napkins for a bbq or disposable plate’s cutlery and paper napkins for informal buffet style catering and on other packages will be real cutlery and crockery glasses etc for more formal style events. If I wanted to hire a machine and cook myself for my party would this be possible? What sort of occasions are best to serve hog roast? Good question, and to be honest there is no exact answer? Why? because hog roast really is one of those catering solutions that really could be suitable for any event. Hog roast makes a great party food where you want to encourage a really friendly, relaxed and informal atmosphere. Hog roast rolls (or ‘pig in a bun’ as we like to call them) really are a big hit with all those who try them. Should I cook the pig or get a caterer to do it? A very good question and one that you may need to think carefully about. Of course, if you do plan on cooking the pig yourself then you will need somewhere suitably accommodating to cook it and that means having a hog roast machine. Luckily, you can hire one from us, complete with gas. The best thing about our catering service is experience of cooking pigs and the fact that you don’t have to do a thing. Just sit back and enjoy a delicious and beautifully cooked hog roast. Why does hog roast taste so fabulous? Well, we could be smart and say that taste is, well, a matter of taste, but that would be cheating! 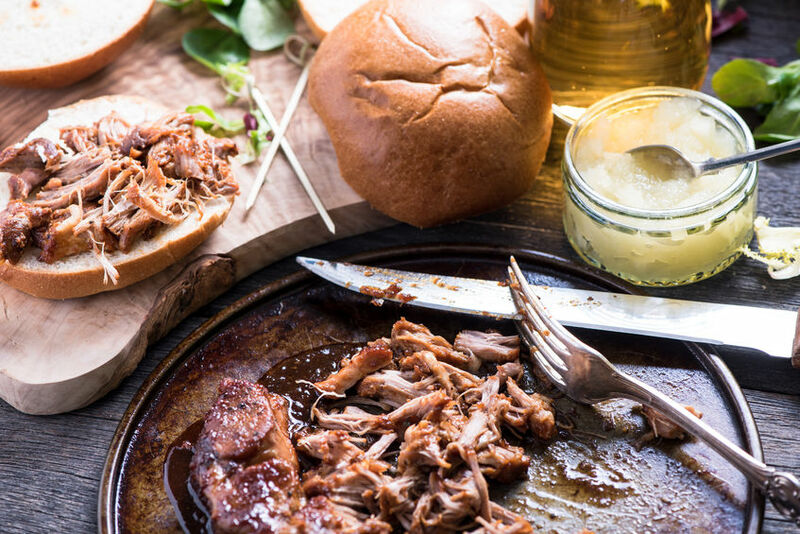 Sounds like you have already made your mind up about the great taste of hog roast and we certainly going to argue with you on that one, but there are quite a few reasons why hog roast tastes so good. Probably the most important factor is slow roasting because this gives you that incredibly rich and wholesome taste that is reminiscent of old style cooking. Everyone loves a roast and hog roast has to be up there with the best. Is hog roast a good choice for a corporate event? Do pigs have curly tails? Of course it is, in fact we would go as far as to say that hog roast is probably the most perfect option for any work based or corporate event that you could think of. Work functions used to be notoriously difficult to find suitable catering for but bring in a hog roast caterer and you have no worries. They can even cook another meat for you if there are people there who cannot or who don’t like meat. A Hog roast is always popular so yes, definitely!